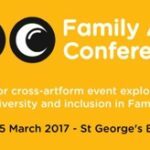 I had the recent good fortune to be able to attend the recent Family Arts Conference at St. George’s and Watershed, Bristol on 15 March 2017 (#FAcon17) as part of Theatre Bristol’s new artist agent initiative. The sunny day provided a warm welcome for an impressive turnout of sector professionals from across the UK. Adeptly produced by Family Arts Campaign, the day-long programme identified current trends and challenges within the family arts sector, as well as offering models for good practice. You can read the full report on the Theatre Bristol website here.